1 capsule every 3 days during a meal containing fats. The “sunshine” vitamin, also called the elixir of life. It is essential for the proper functioning of the organism, even though it is widely associated only with preventing rickets in children. If we wanted to take care about the proper level of vitamin D3 in the organism in a natural way, we would have to spend whole days in the blazing sun. A very pleasant perspective, yet in our climate – quite impossible. This is where common vitamin D3 deficits come from among the residents of our country. Therefore, I recommend regular use of the supplement that will allow you to complement vitamin D3 deficits in the organism and help to take care about maintaining its proper level. Regular use of the capsules with vitamin D3, at least off-season, is a compulsory element of our daily health care. The product contains a relatively high dose of vitamin D3 and according to the producer’s recommendations you should take 1 capsule every 3 days. For our climate, however, such a dose is understated, appropriate maybe only to young people, among whom vitamin D3 deficits have not been stated. 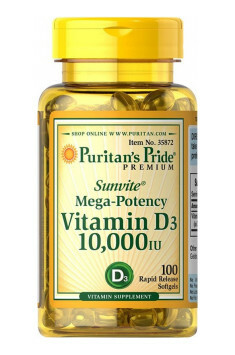 I suggest that adults, elderly and obese people use 1 capsule every day, at least in the period from September to April, when there is little sun and natural synthesis of vitamin D3 is inhibited. Vitamin D3 is soluble in fats, therefore we should always take it with meals, in which fat is present. This vitamin supplementation is worth combining with vitamin K2 (osteoporosis prophylaxis).